We have a lot to be thankful for! 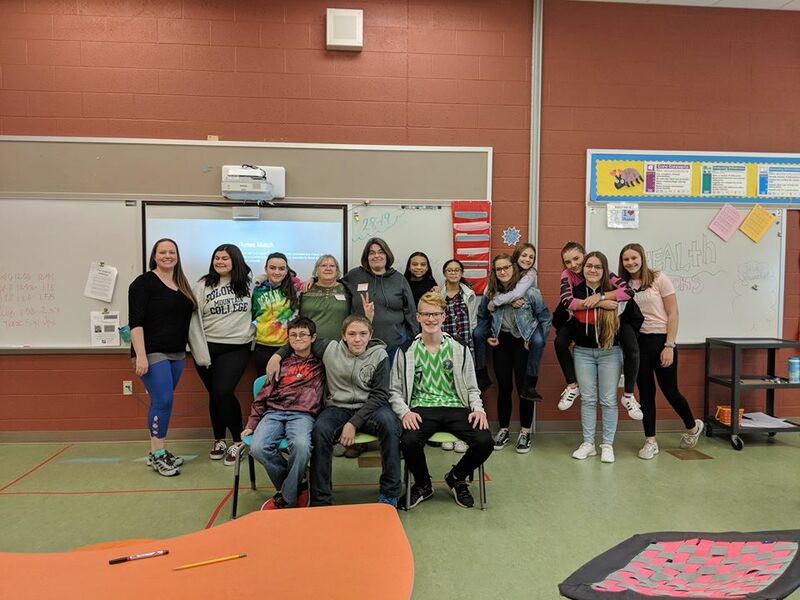 Some ladies in our peer mentorship group spoke to the wonderful students of Williamsport Middle School's Positivity Club about taking time to help others and listen to their stories. Together the Positivity Club and Wildflower Enterprises is making a difference in the school, community and world. While Wildflower Enterprises works at the intersections and with many individuals we are always willing to be a source of support for survivors of violence. The best part of our new relationship with the Positivity Club is that it all started with Samantha who designed and wrote the story for the survivor stool! The Positivity Club purchased the stool and now has it on display at the school. We are so proud of Samantha! She has asked us to share her story behind this design. She made the survivor stool to show light coming from darkness. Today she was able to live out her calling and educate the Positivity Club about domestic violence and sexual assault. She is a survivor! We can all learn so much from her. While we lift this message we also want to remind you there wonderful services that help survivors like hotlines, emergency shelters and legal advocacy. It is okay to ask for help! The national hotline number Is: 1-800-799-SAFE. There are a lot of people who are working with Wildflower. Each person is working with us in unique ways! Allison (Alli) Barry loves the outdoors. She can tell you about some awesome hiking trails throughout Middle and East Tennessee. She also loves animals. From snakes to cats she can educate you on each. As well as all of this, Alli is Wildflower Enterprises’ Business Administration intern! Alli will be working to help us secure and schedule craft fairs, presentations, and make sales. So if you are interested in meeting us through these ways you will most likely meet Alli. Also, she currently studies business at Tennessee Tech University. Have you ever realized you can have a lot in common with someone living in a completely different culture than you? That’s what I have realized while finding artists for Wildflower Enterprises. This is also why I have connected with the Bahamas. I am really excited to introduce you to another Wildflower Bahamian artist Sharmaine Knowles! I first met Sharmaine in June at Freeport Methodist Church. Wildflower Enterprises’ will be working with Sharmaine build clientele for her designs. HUGaNUG LRS represents, Love, Royalty and Strength. Every design tells a story. The birth of my business came about as a result of me listening to a local radio station when House of Assembly was in session. The cabinet members would from time to time use catchy phrases when speaking in Parliament. One day I said to my husband how cool it would be to put those phrases on a tee shirt. Right then sitting in my husband company truck, I began writing some phrases down and of course some were horrible but, one day my husband went through my book. He told me that some of the phrases were really funny and that I should pursue the business. Six years later, HUGANUG LRS was realized. "Each day my kids and I would say failure is not an option. We as women should inspire other women without bias because of race or even status. That is what I say to people when we talk. My you continue to succeed at your business. In our Peer Mentorship group participants have the opportunity to learn how to upcycle furniture. The process we teach is painting. Did you know that painting helps with healing? Also, painting is a spiritual practice and painting and praying can go naturally together. This is a creative practice, and Wildflower Enterprises offers the space for individuals to practice this. Pictured here is Samantha. We are so proud of all she has accomplished with her first upcycled project. She has designed this stool, and told a beautiful story. 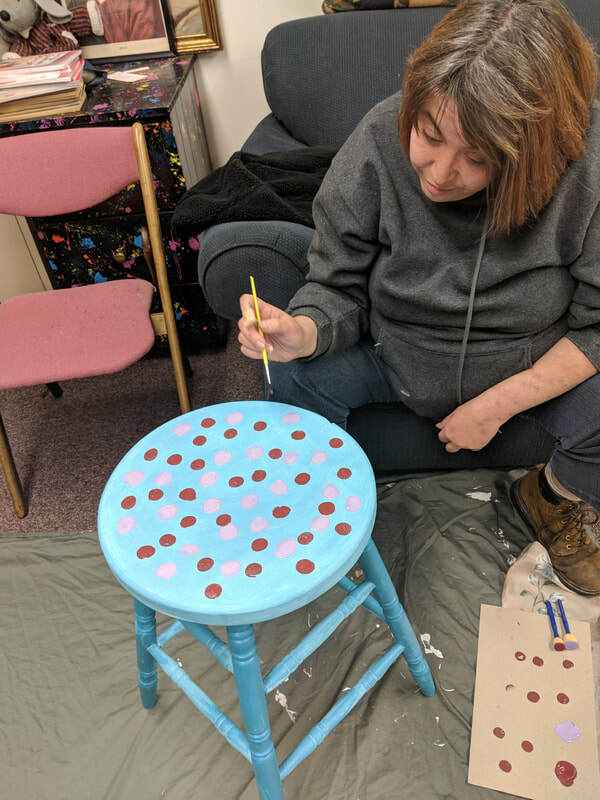 She is a survivor of violence, and as she was painting the stool she discussed how she wants to help other women who have experienced violence like she has. 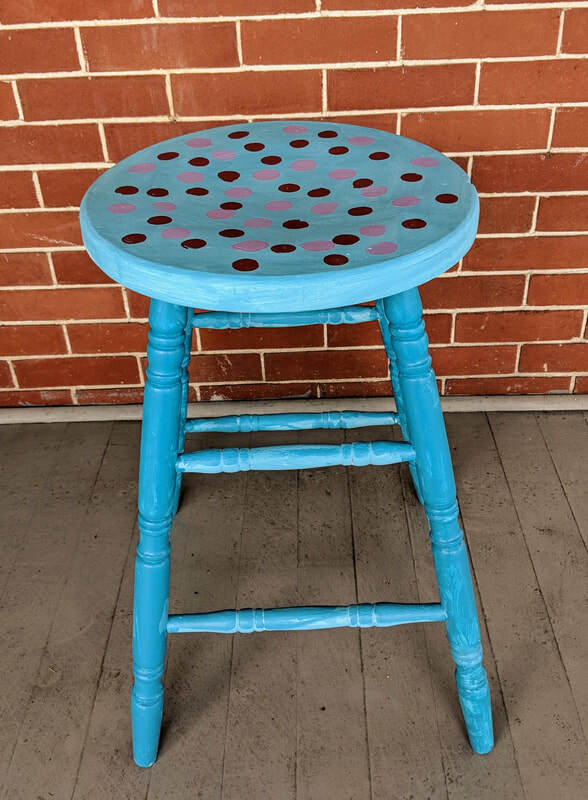 The colors she chose for this stool is a message she wrote for other survivors. This is her message for other survivors. We are a diverse group of women from all backgrounds and ages. We find a place for anyone in this group and recognize that everyone brings unique perspective and designs. Our enterprise intentionally opens our doors to women in rural PA who are overcoming different traumas. Whether it is transitioning out of homelessness, completing rehab, finding hope after violence, or overcoming the past know you are welcome here! We use the craft of upcycling to inspire women! Browse through our completed projects! Check out our stories to read about some of our community partners! Designed by a leader in our peer mentorship group, Trista. She's an amazing artist and teaching us lots of new skills from graphic design to detailed painting. She tells us these colors represent God's creation. The blue is for water and the gold is for sunshine. Support this artist today by purchasing these candlesticks. Remember Samantha, the designer of the survivor stool? Well she has completed her second project in our peer mentor group! Samantha's passion and commitment to helping us build Wildflower Enterprises peer mentor group has been an asset! Support her work today by purchasing this beautiful table. Can not be shipped. Must be picked up in PA.
Fund Us! Support Our Classes! This is the story of how Bahamian artist Emily Strachan joined our Wildflower Enterprises endeavors. Emily's designs are called Enthusia designs. I (Kacie) was worshipping at Freeport Methodist Church in Freeport, Grand Bahama. This was my first worship service with this congregation. I still did not know many people. I sat by Sharon Mcgregor, a member of the church. (Sharon is now a board member of Wildflower Enterprises!) Sharon and I started talking about our passions, life in our countries, and many other random topics. She taught me a great deal about Grand Bahama in our first conversation. My first introduction to Emily was during the passing of the peace. If you are familiar with traditional Christian worship services you know the passing of the peace usually happens at the beginning of worship in order to welcome others to church. At Freeport Methodist Church the passing of the peace is very friendly! In Grand Bahama you give hugs to everyone young and old during this time. What a way to meet a ton of people you never met before! After the worship service I saw Emily pin a handcrafted headband with the aquamarine blue and yellow Bahamian colors on a little girl. Emily told me then she was passionate about making items with the Bahamian colors for people in her community. I held hands with Sharon as we sang. This night was a moment I will never forget. God had truly reminded me that there was an open door for Wildflower Enterprises to go through. I was going through this door with my new friends Sharon and Emily. Emily and I talked more after the service, and she said, “I am going to pick you up Thursday and drive you to my apartment. Is 3:00 good?” Before I could think if it was a good time or not, "Yes!" just came out of my mouth. So it was planned I was going to Emily’s apartment the next day! My thoughts raced: "Oops! I didn’t ask permission from my leader Pastor Lenore to go. Hopefully she will say this was okay." Well, it all worked out! On Thursday Emily and I drove over to her crafting apartment. We talked about women’s empowerment and teaching marginalized women. Wow, we had a lot of the same passions! At her apartment she introduced me to her abundance of crafts! Emily makes a huge variety of products: necklaces with the Bahamian colors, hand-painted stone necklaces, hair clips made from palm trees and sea shells, beautiful beads made from sand, decorative flowers made from coconut, and pins made from fish scales. There is so much more that Emily makes, but I can't even remember all of them now! We had a great time! After I was introduced to her crafts we sat down, we fanned ourselves with the handmade fans made from palm trees and talked about the future of Wildflower in the Bahamas. We both felt God was working with us. We made a plan and thus it began! Emily drove me back to Freeport Methodist Church. We jammed to some great Junkanoo Bahamian music. I felt free. I felt I gained a new friend. I felt at home! The song we were jamming to talked about a house on a hill by the beach. Little did Emily know at the time that one of my favorite things to do is jam to music as I drive back roads in my hometown! This time I was doing it in the Grand Bahama! This brings me to one of the best lessons I learned from Jean Johnson’s book, We Are Not the Hero. Quoted on page 63, “We can waste these beginning moments or we can see these beginning moments as work.” I felt at that time I was truly doing work I loved. We were both enthusiastic! For me I was doing one of my favorite things--driving backroads, windows down with catchy music. However, it was rewarding because in these beginning moments of friendship with Emily, we already were working together! We are entrepreneurs from two different cultures, and we both have a passion to empower women through entrepreneurship and crafting! Learn more about Emily’s work in the Bahamas, shop her collection we have by booking one of our Wildflower in the Bahamas presentations! “You can use anything to make a living, and you can be as creative as much as you want.” -Bridget Davis, 2018. What a beautiful message of inspiration Bridget Davis tells us! I’m really excited to share the work of Bridget. She is an entrepreneur and artist in Freeport, Bahamas. I had the opportunity to meet and interview Bridget in June. Thanks to my role model Lenore Hosier who also introduced to me to Bridget, invited me to come see the beautiful Bahamas, and let me be part of these relationships in Freeport. During my interview with Bridget she stated she had the opportunity to start a small business when hurricanes happened in 2004. She said many were out of work. Her sister Gina did a course in coconut jewelry making. Gina started the business at home. She then got the opportunity to bring the business to Port Lucaya. Now Bridget and Gina have locations in Garden of the Groves and Port Lucaya in Freeport. They sell to visitors and locals. Bridget and her sister Gina make beautiful jewelry from coconuts. Bridget said she wished more people knew they can use nature to make beautiful things and make a living. In her shop in Garden of the Groves she sells work from other artists in the Bahamas as well. She has traveled to one of the family islands and bought hand woven baskets from women on a family island. She sells these in her shop as well as a piece of educational material about the family islands. She is creating sustainability on the islands with honoring the artwork from other women. She is passionate about lifting the voices of other artists and supporting communities on other islands. ​I asked Bridget, "If you could help Bahamian women in any way, what would that be?" She said, "We want to encourage Bahamian women to understand they are hard workers and deserve to say that their piece of work is valuable." She is part of a sustainable tourism committee in Freeport and passionate about helping Bahamian women market their product and skill sets! Thank you Bridget for being an inspiration! Pictures above: Bridget with good friend Lenore and Bridget with Kacie after the interview. You can help Wildflower Enterprises tell inspirational stories by purchasing one of our picnic blankets! These upcycled designs promote sustainability in multiple ways. Created for conversations these blankets are made to empower you to do justly, walk humbly and love mercy. They are all different sizes, textures and use different colored threads. Some are made from clothing, vintage fabrics and other fabrics that were meant to go in the trash. The imperfections tell a story. 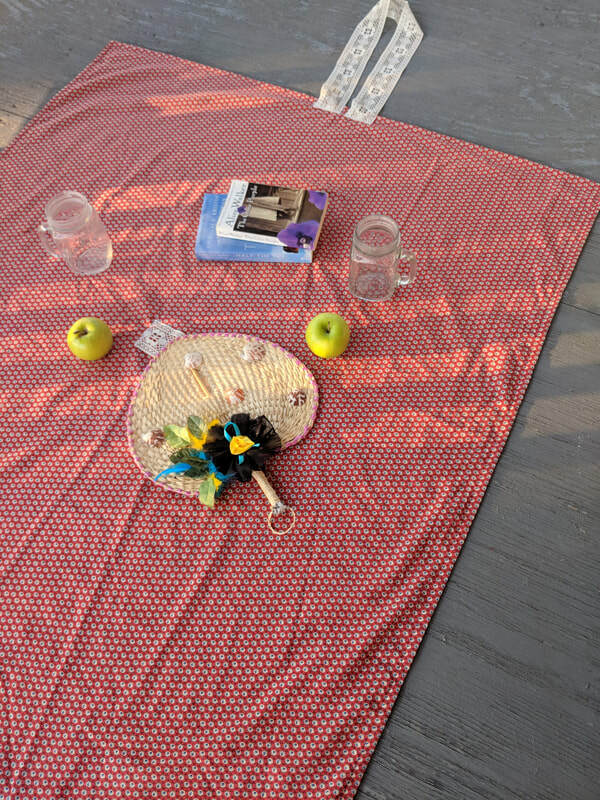 We hope you tell many stories on your picnic blanket, make lifelong memories and make the world a better place! -These are handcrafted in Pennsylvania.